Harley Davidson CV Carburetor home made intake gaskets performance tips and mods.MINDLESS BORING:The stock constant velocity carburettor on Harley Davidson motorcycles is often a source of poor performance issues for motorcycle owners not in tune with annual maintenance. Un beknownst to most motorcycle enthusiast the stock Harley Davidson CV carburettor is a high performance engine part that requires tuning and maintenance. From the factory the stock Harley Davidson CV carburettor is tuned to meet emissions regulations and therefore quite on the lean side of proper air fuel ratio for the Harley Davidson evolution engine or big twin. With but a few modifications the off the shelf Harley Davidson CV carburettor can be made to perform in the high performance fashion for which the engineers intended. C.V. (constant velocity) is the essence of the variable venturi design adjusted by vacuum, which is a by product of your engine spinning, the more it spins, the more vacuum it has. Atomizing fuel, under the huge array of operating conditions that may be encountered by any engine including throttle position, ambient temperature, traffic conditions, riding style, altitude, being the most important. An idling engine has no riding style so therefore altitude and barometric conditions are the only existing feature. The ultimate carburettor, is one that is able to adjust itself to accommodate these varying conditions under all circumstances. This is accomplished, by the CV carburettor's, ability to adjust the venturi size "variable venturi", thereby allowing essentially a perfectly sized Carburettor for the operating condition encountered. This is the beauty of a CV carburettor. Is that beautiful or what?! Well yes, I think it is. And here's why, for guys old enough to remember the "quadra-bog", or quadra-jet from General Motors, which was a 4 barrel carburettor, that utilized vacuum secondaries, or that, the 4 barrel was not exposed to the engine, unless a pre-determined vacuum was met, the front smaller half 2 barrel part of the carburettor, was utilized to maintain fuel economy and off idol throttle response from a possibly heavily loaded engine that could not maintain engine vacuum or rpm with a four barrel throttle opening to maintain proper fuel atomization and combustion. Therefore, leading to a sputtering, popping, backfiring, you name it, running engine. This is the fault of the maintenances, and failure to re torque intake manifold parts on schedule. The Harley Davidson intake manifold, by design, has what can be called a slip fit, in order to compensate for expansion and contraction differences between the hot rear cylinder and cooler front cylinder inherent in the air cooled Harley Davidson V-Twin design. the Harley Davidson evolution engine with CV Carburettor, intake manifold, and gaskets, can be likened to a compression plumbing fitting. The factory Harley Davidson intake manifold gaskets, are in compression on the head contact surface, and a radius surface controlled by torque/squish on its flange. This item is often overlooked as maintenance because of the difficulty of access. 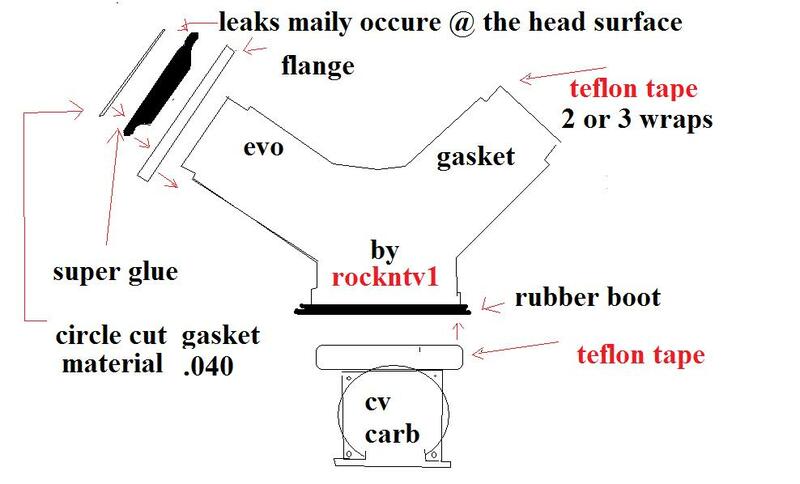 Wrench suggestions by rockntv1 here. On Harley Davidson engines with aluminum heads and this slip fit manifold intake arrangement, the surface at which the intake manifold flange and head meet, seems to be the most susceptible to leaks. The crushing action, of the radius section over the intake manifold, seem to be less susceptible to air or vacuum leakage, due to the crushing forces on the gasket. The actual flat surface, of what at this point I will call a doughnut, type gasket, against the cylinder head and the corresponding crud that seems to occur here, seems to be the susceptible Carburettor area to air and vacuum leakage on this intake manifold arrangement. Stock Harley Davidson CV Carb modifications: Ladies and gentlemen, jetting is on a per bike and per geographical location basis, however standards can be followed, unless you are riding a motorcycle equipped with a CV Carburettor in a geographical location drastically different from where it was purchased, and a virgin from the golden screwdriver from the chrome world driven performance market, you hopefully have a stock Harley Davidson Carburettor which has been calibrated nearly right, by using these tips you might well gain both the horsepower you were looking for or increased fuel mileage for long scenic touring rides. A main source for problems for CV Carburettors, is the fuel; a lot of the alcohol/methanol based fuels these days tend not to season well for non year round motorcycle riders. The smallest of fuel mixing circuits in the CV Carburettor is the slow and idle circuit. This is the first to foul in a dirty Carburettor the slow idle circuit in a Harley Davidson CV carburettor is also most susceptible to problems induced by air or vacuum leaks elsewhere in the intake manifold, because it is responsible for engine fuel mixing conditions up to 3/4 throttle. It is amazing to me how many Harley Davidson motors on the road riding around pop, fart, gasp and sputter because of improper idle adjustments or air and vacuum leaks. The stock Harley Davidson CV carburettor comes from the factory with a non-adjustable idle circuit. This well known modification tip consists of accessing the idle adjustment screw hidden by the factory installed ball plug. This may be removed by whatever mechanical abilities you may have on hand, with care not to damage the driver slot on the slow circuit adjustment below. For approximation, this depth should be near the diameter of the plug. In this video I use guitar strings to verify the openings of all circuits in this Carburettor. Unfortunately I borkt the tape. You get what you get. K, this CV Carburettor was set up by an independent cycle shop, with a number 48 slow speed jet, and a 170 main jet which as at this time unverified stock needle. We of course, added / .060 shim to this, and removed 1 coil, or approx, .250" from the cap side, or top side of the spring. For lighter motorcycles and single up riders this will improve slide speed and throttle response over a broad rpm range this previously unmaintained CV Carburettor was polished with 480 wool, @ the transition between, the machined surface of the venturi and the Carburettor housing casting, which in my experience is never straight. While of seemingly small benefit, my intent is to take a non-idling motorcycle to a riding machine that has gained approximately 5 horsepower and similar gains in fuel economy. This particular motorcycle from my standpoint is unmaintained over its street life. while its been to the shop, at check book expense, of my friend, in previous days, shody results, we fix. my friend, fellow drummer, rider and holder of broke motor cycle came to me with a Carburettor in a dish. comes back bikes runs full broken choke cable, we fix, on a Sunday, with a sad face and this is where I lead you to my video, the tips and tricks involved with helping you increase your horsepower and fuel economy on your Harley Davidson CV Carburettor equipped motorcycle will show you the aspects involved with maintaining a high performance Harley Davidson CV Carburettor.